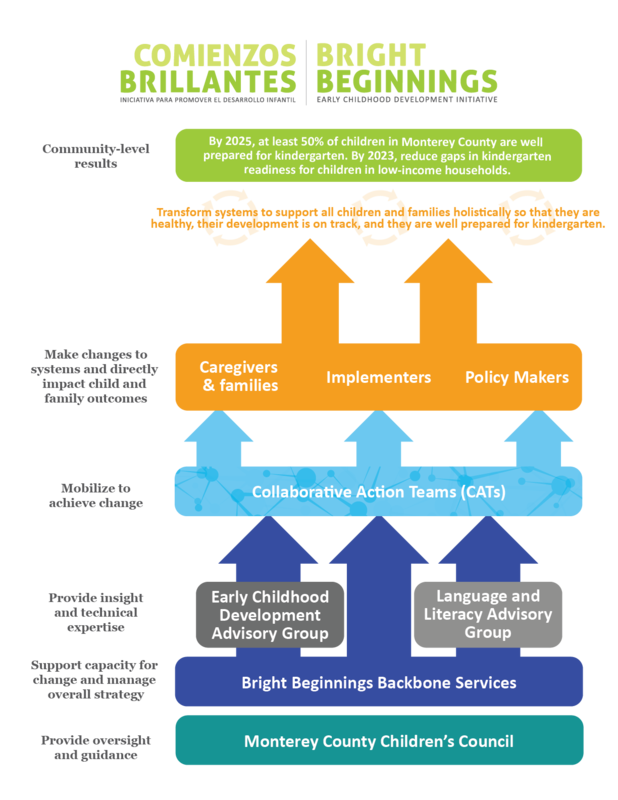 Bright Beginnings supports collaboration within Monterey County’s strategic framework for early childhood development: “Together, preparing every child for life and school”. Bright Beginnings uses an approach called Collective Impact to create lasting solutions to social problems on a large-scale. Bright Beginnings helps organizations — including those in government, civil society, and the business sector — coordinate their efforts and work together to achieve our shared community goals of doubling kindergarten readiness and closing equity gaps for children in low-income households. Collective Impact takes our existing partnerships and makes them intentional, broad, and coordinated. It means we are holding each other accountable for achieving our shared vision of transforming systems to better support children and families. Bright Beginnings and Bright Futures Education Partnership support community change efforts. Together we share a focus on children’s kindergarten readiness and access to early care and education, as key parts of the success within the cradle to career education spectrum. Bright Beginnings’ focuses on the holistic development of babies and young children in the context of their families and communities. Bright Futures is focused on education outcomes all the way through adulthood. The Early Childhood Development Advisory Group and the Language and Literacy Advisory Group (for Bright Futures Goal 3) work across both initiatives to deepen our shared vision and provide guidance on strategies and approaches needed to achieve our shared community goals. Click here to learn more about our partnership with Bright Futures. Bright Beginnings provides capacity building and technical support to Collaborative Action Teams (CATs), including teams based in six communities in Monterey County: North Monterey County, Pajaro, Seaside, Salinas, Gonzales, and Greenfield. These groups are the “change makers” – those leading the charge to implement change projects, and help policy makers, service providers, and families make changes that will directly impact children’s health and well-being. The “Backbone” is made up of the staff that provide overall strategic management of the initiative and support to all of the partners in achieving our shared vision. The Backbone does not represent any organization or specific program, but is charged with supporting the partnership as a whole in achieving transformational change. The staff acts as a neutral convener, facilitator and data analyst to guide and support the work of the Initiative. The Backbone for Bright Beginnings is hosted at First 5 Monterey County, and works in close collaboration with the Backbone of Bright Futures. Current Backbone staff include a Senior Manager and part-time administrative assistant, as well as consultants supporting facilitation, community engagement, project management, communication, and data and evaluation. The Monterey County Early Childhood Development Advisory Group is made up of thought leaders and experts in early childhood development. Its role is to provide insights and technical knowledge to guide the strategies and change projects supported by Bright Beginnings and Bright Futures. In 2017-2018 the Advisory Group led the process of developing “Together, preparing every child for life and school,” a new strategic framework for early childhood development in Monterey County. The Early Childhood Development Advisory Group meets on a quarterly basis and is focused on supporting further development of the strategic framework, and monitoring strategy design and implementation to support more effective collective action. The Monterey County Children’s Council (MCCC) serves as the Steering Committee for the initiative. The Children’s Council was established by the Monterey County Board of Supervisors in 1992 to provide leadership and policy direction. It is made up of key county departments and partner agencies. As a Steering Committee, the Council helps guide the initiative, and also takes necessary actions to transform outcomes for children and Families, in line with their mission. The MCCC members are champions for Bright Beginnings throughout the county. Being a champion means that they align their own work and policies with our shared goals. It also means that they are stepping up to be held accountable for achieving community-level changes that none of them can achieve alone.